This paper examines the effect of natural resource dependence on growth in a cross-country setting during 1970 to 2010, first accounting for the effect of resource export dependence on institutional development. We employ several political and governance indicators, numerous econometric techniques on two separate panels, including one post-cold war. 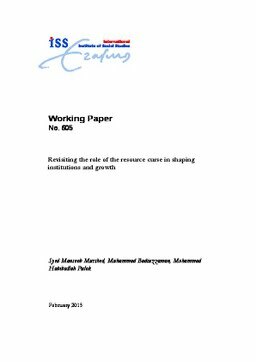 Our findings suggest there is a resource curse adversely effecting growth via institutional deterioration in the longer term (1970-2010), but recently (1995-2012) there is a reversal of this adverse effect on some institutions. Moreover, certain institutions matter more for growth, including governance and constraints on the executive relative to democracy.